In north-eastern Halkidiki, a long struggle, which has taken the form of an uprising of the local residents against the forces of repression but also against the local authorities, has brought to the foreground the issue of capitalist development, as well as the power of resistance when it is exercised by the citizens themselves. Canadian mining company Eldorado Gold, operating with the scandalous complicity of the Greek state and the largest Greek construction company, Aktor, decided to erase from the map an area of old-growth forest, which sustains local activities such as livestock breeding, beekeeping and agriculture, of beautiful beaches with low-intensity tourism, and of inexhaustible water resources. As anticipated, their plans are not limited to Halkidiki, but extend throughout Macedonia and Thrace, where significant gold deposits have been detected. The method of cyanide processing, used by the company in mining projects all over the world, leaves no doubt about what is already happening in the region or what will happen in the future. This pharaonic project, expected to cause a wide-scale ecological disaster in Greece, could not proceed without harsh repression, thus bringing into existence another heavy industry, the industry of judicial prosecution. Currently, more than 300 local residents and solidarity supporters are being prosecuted, many of whom are charged with criminal law offenses. And while all this developed during the years of the PASOK and New Democracy governments, which have exhibited an implacable attitude in the region, a year ago there were indications that something could change at the institutional level. First with the municipal elections, in May 2014, where the new mayor was supported by the anti-mining movement, and later in the parliamentary elections, in January 2015, where a party that promised to stop the mining project, Syriza, was the most voted. However, developments are disappointing for those who pinned all their hopes on the institutions. Two months ago, the mayor of the region resigned, unable to offer a significant response to the problem. The new left-wing government is limited to trying to gain “political time”, since it has no intention of openly confronting the two companies, Eldorado and Aktor. As a result, the development works at the mining area are going on with increasing intensity, transforming the old-growth forest of Skouries into a lunar landscape. On the other hand, the anti-mining movement, the largest movement in crisis-stricken Greece, is now at a crossroads, overburdened by the weight of the trials and prosecutions that are already underway, as well as the upcoming ones. It is thus proven beyond doubt that the promises of a definitive solution of the problem through political delegation will not be fulfilled. The time lost waiting for an institutional solution testifies to the fact that only the unmediated grassroots struggle can lead to a victory for the anti-mining movement. The autonomy of the movements in front of any government should be an inviolable principle. This is the new cycle of struggle that is now opening among the residents and the struggle committees. 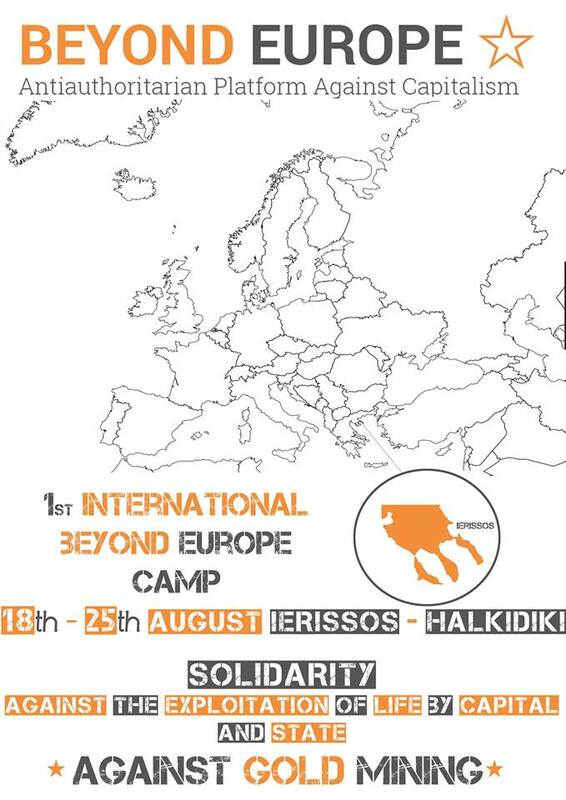 At this specific moment, the international anticapitalist/antiauthoritarian network “Beyond Europe” takes the initiative to organise a solidarity and struggle camp on August 18 - 25, at the beach of Ierissos, in an area that suffered the greatest state repression. This is an invitation to everyone who wants to be active in the struggle for Land and Freedom, against the destructive plans of the capital. We invite individuals and collectives to participate in the political and cultural events planned, as well as in a demonstration in the restricted area, which is being prepared in collaboration with the local residents. 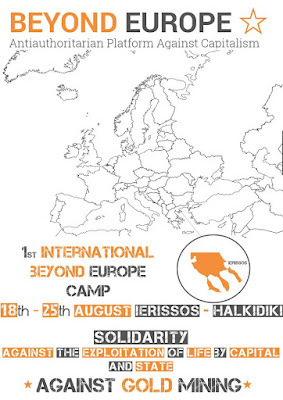 We invite you to contribute a breath of freedom to a significant struggle, the development of which, at the present stage, will be the beacon of many other struggles in Greece. For us, the meaning of life lies in the international common ground of struggle for the liberation of the people from the tyranny of rapacious capitalism and from the hegemony of the state and the ruling class. Αναρτήθηκε από Σ.Μ.Σ. στις 2:44 π.μ.